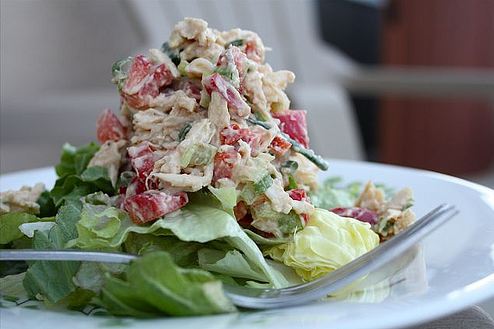 Holiday Chicken Salad is a superb recipe and the dried cranberries add a sweet tartness to chicken and vegetable salad. It make a delightful sandwich filling and can also be served on lettuce cups. Take a medium bowl and mix together mayonnaise with paprika and seasoned salt. Blend in dried cranberries, celery, bell pepper, onion, and nuts. Now add chopped chicken, and mix well. Season with black pepper to taste. Chill for 1 hour, and its ready to serve.